The RSS feed is updated when new videos and other types of content are online. Submit your email address to be contacted when new videos and other types of content are online. Your email address will not be given to any third party or used for any other purpose. If you want to Tweet about this video click here. I this webseries rocks: thewebsiteisdown.com. 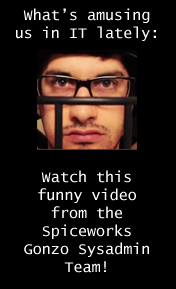 Check out this funny Spiceworks Video! As you may remember I attended SpiceWorld last year and SpiceWorks made an appearance in Episode 4.5: Chipadmin. Here's a funny video they made for Spiceworld 2011.